Justin Jordan’s first original series at Avatar, Dark Gods, is a unique look into the horror genre. Within the pages we see a group set against allowing the chaos of the universe to penetrate our world and turn the orderly civilization of human beings into a charnel house. The element of chaos as an entity or power working to corrupt the world is an interesting concept. Jordan encapsulates it perfectly in the old gods that are attempting to crack our consciousness and run rampant over the world. 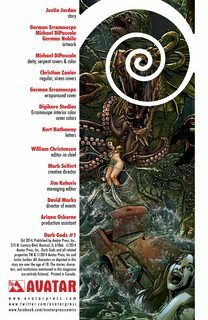 Dark Gods is a mix of H.P. Lovecraft meets the Matrix that will keep you on the edge of your seat while you watch the events unfolding. 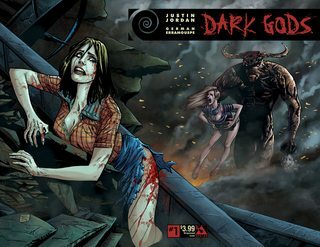 If you are looking for something original to add to your horror reading list, ask your local comic shop to hold copies of Dark Gods #1-3 and begin your descent into madness.